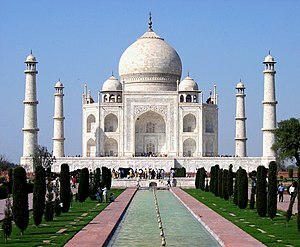 The Taj Mahal unites Persian and Indian elements. It is the mausoleum of Mumtaz Mahal, the Persian wife of Mughal Emperor Shah Jahan. Indo-Persian culture refers to those Persian aspects that have been integrated into or absorbed into the cultures of the Indian subcontinent. Persian influence was first introduced to the Indian subcontinent by Muslim rulers of Turkic and Afghan origin, especially with the Delhi Sultanate from the 13th century, and in the 16th to 19th century by the Mughal Empire. In general, from its earliest days, aspects of the culture and language were brought to the Indian subcontinent by various Persianized Central Asian Turkic and Afghan rulers, such as Sultan Mahmud Ghaznavi in the 11th century. Persian was the official language of the Delhi Sultanate, the Bengal Sultanate, the Bahamani Sultanate, the Mughal Empire, and their successor states, as well as the cultured language of poetry and literature. Many of the Sultans and nobility in the Sultanate period were Persianised Turks from Central Asia who spoke Turkic languages as their mother tongues. The Mughals were also culturally Persianized Central Asians (of Turco-Mongol origin on their paternal side), but spoke Chagatai Turkic as their first language at the beginning, before eventually adopting Persian. Persian became the preferred language of the Muslim elite of north India. Muzaffar Alam, a noted scholar of Mughal and Indo-Persian history, suggests that Persian became the official lingua franca of the empire under Akbar for various political and social factors due to its non-sectarian and fluid nature. The influence of these languages led to a vernacular called Hindustani that is the ancestor of today's Urdu and Hindi. Indo-Persian culture has helped produce certain composite traditions within the Indian subcontinent that survive to this day, of which the Urdu language and literature is notable. The legacy of Indo-Persianate culture moreover can also be seen in much of the Mughal architecture within Lahore, Delhi, Dhaka, and Agra, latterly of which the Taj Mahal is world-renowned. Hindustani classical music also received some influence from the Persian culture, but the nature of these influences remain unclear. In many ways, the absorption and assimilation of Persian or Persianate culture within India may be compared to the gradual (if sometimes problematic) absorption of English, British or Western culture generally of which the English language is perhaps the most notable and controversial within both India and Pakistan today. The influence of Persian language moreover may be seen in the considerable proportion of loanwords absorbed into the vernaculars of the north, north-east and north-west of the Indian subcontinent including Punjabi, Gujarati, Urdu, Hindi, Bengali, Kashmiri and Pashto. Universities in India, Pakistan and Bangladesh also operate Persian language faculties. With the presence of Muslim culture in the region in the Ghaznavid period, Lahore and Uch were established as centers of Persian literature. Abu-al-Faraj Runi and Masud Sa'd Salman (d. 1121) were the two earliest major Indo-Persian poets based in Lahore. The earliest of the "great" Indo-Persian poets was Amir Khusrow (d. 1325) of Delhi, who has since attained iconic status within the Urdu speakers of the Indian subcontinent as, among other things, the "father" of Urdu literature. 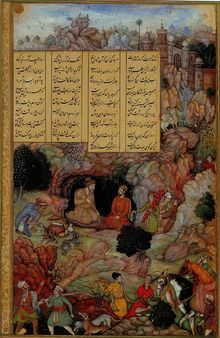 Alexander Visits the Sage Plato, from Khamsa-e Nizami by the Indo-Persian poet Amir Khusro. Indo-Persian culture and to varying degrees also Turkic culture flourished side-by-side during the period of the Delhi Sultanate (1206–1526). The invasion of Babur in 1526, the end of the Delhi Sultanate, and the establishment of what would become the Mughal Empire would usher the golden age of Indo-Persian culture with particular reference to the art and architecture of the Mughal era. The Mughal Era to the British Raj: Persian persisted as the language of the Mughals up to and including the year 1707 which marked the death of the Emperor Aurangzeb, generally considered the last of the "Great Mughals". Thereafter, with the decline of the Mughal empire, the 1739 invasion of Delhi by Nader Shah and the gradual growth initially of the Hindu Marathas and later the European power within the Indian subcontinent, Persian or Persian culture commenced a period of decline although it nevertheless enjoyed patronage and may even have flourished within the many regional empires or kingdoms of the Indian subcontinent including that of the Sikh Maharaja Ranjit Singh (r. 1799–1837). Persian as a language of governance and education was abolished in 1839 by the British and the last Mughal emperor Bahadur Shah Zafar, even if his rule was purely symbolic or ceremonial, was overthrown in 1857 by the British. Further, C.E. Bosworth wrote about the Central Asian's Persian (Tajiks→Ghurids) influence on India: "...The sultans were generous patrons of the Persian literary traditions of Khorasan, and latterly fulfilled a valuable role as transmitters of this heritage to the newly conquered lands of northern India, laying the foundations for the essentially Persian culture which was to prevail in Muslim India until the 19th century..."
Bengal was the eastern frontier of the Persian cultural sphere. For over 600 years (1204-1837), the Persian language was an official language in Bengal, including during the provincial period of the Delhi Sultanate; the independent period of the Sultanate of Bengal; and the dominion period of the Bengal Subah in the Mughal Empire. Bengal was the subcontinent's wealthiest region for centuries, where Persian people, as well as Persianate Turks, settled in the Ganges delta to work as teachers, lawyers, poets, administrators, soldiers and aristocrats. The Bengali language continues to have a significant amount of Persian loanwords. Several Bengali cities were once centers of Persian prose and poetry. Hafez, one of the masters of Persian poetry, kept a notable correspondence with one of the Sultans of Bengal. The Mughal period saw the zenith of Persian cultural expression in Bengal. During the Bengali renaissance, Persian was studied by Hindu scholars, including Raja Ram Mohun Roy. The use of Persian as an official language was prohibited by Act no. XXIX of 1837 passed by the President of the Council of India in Council on the 20 November 1837. Ruins of a madrassa built by Mahmud Gawan, the Bahamani minister. 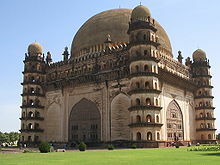 Gol Gumbaz, the mausoleum of Mohammed Adil Shah, Sultan of Bijapur. The medieval Bahamani Sultanate and its successor Deccan sultanates of Central India had heavy Persian influence. The Bahamani sultans actively recruited Persian or Persianized men in their administration. Sultan Firuz (1397-1422) would send ships from his ports in Goa and Chaulto the Persian Gulf to bring back talented men of letters, administrators, jurists, soldiers and artisans. The high born Iranian Mahmud Gawan (1411-1481) who rose to become a powerful a powerful minister of that state during the reign of another Bahamani Sultan. The Bahmani Sultanate disintegrated into five Deccan Sultanates, similar in culture. Hyderabad, built by the Golconda Sultanate in the 16th century, was inspired from Isfahan. The use of Persian as a court language in Hyderabad continued under the Nizams of Hyderabad, and was only replaced by Urdu in 1886. The court language during the Deccan sultanate period was Persian or Arabic, however, Marathi was widely used during the period especially by Adil Shahi of Bijapur and the Ahmadnagar Sultanate. Although the rulers were Muslims, the local feudal landlords and the revenue collectors were Hindus and so was the majority of the population. Political expediency made it important for the sultans to make use of Marathi. Nevertheless, Marathi in official documents from the era is totally Persianised in its vocabulary. The Persian influence continues to this day with many Persian derived words used in every day speech such as bagh (Garden), karkhana (factory), Shahar (city), bāzār (market), dukān (shop), hoshiār (clever), kāḡhaz (paper), khurchi (< khurchi (chair), zamin (land), zahirāt (advertisement), and hazār (thousand). Given that the Mughals had historically symbolized Indo-Persian culture to one degree or another, the overthrow of Bahadhur Shah Zafar and the institution of the British Raj in 1858 may be considered as marking the end of the Indo-Persian era, even if, after First War of Independence in 1857, Persian would still retain an audience and even produce commendable literature such as the philosophical poetry of Muhammad Iqbal (d. 1938). In Pakistan, Urdu and other regional languages retain extensive Persian vocabulary. ^ Alam, Muzaffar. "The Pursuit of Persian: Language in Mughal Politics." In Modern Asian Studies, vol. 32, no. 2. (May, 1998), pp. 317–349. ^ http://www.iranicaonline.org/articles/ghurids Iranica: GHURIDS or Āl-e Šansab; a medieval Islamic dynasty of the eastern Iranian lands. ^ Eaton, Richard M. (2005). The new Cambridge history of India (1. publ. ed.). Cambridge: Cambridge University Press. pp. 51–52. ISBN 9780521254847. ^ Eaton, Richard M. (2005). The new Cambridge history of India (1. publ. ed.). Cambridge: Cambridge University Press. pp. 59–72. ISBN 9780521254847. ^ Eaton, Richard M. (2005). The new Cambridge history of India (1. publ. ed.). Cambridge: Cambridge University Press. pp. 99–101. ISBN 9780521254847. ^ a b "'Persianate culture forms intrinsic part of Hyderabad' - Times of India". The Times of India. Retrieved 2018-11-14. ^ Kulkarni, G.T. (1992). "DECCAN (MAHARASHTRA) UNDER THE MUSLIM RULERS FROM KHALJIS TO SHIVAJI : A STUDY IN INTERACTION, PROFESSOR S.M KATRE Felicitation". Bulletin of the Deccan College Research Institute. 51/52,: 501–510. JSTOR 42930434. ^ Qasemi, S. H. "MARATHI LANGUAGE, PERSIAN ELEMENTS IN". Encyclopedia Iranica. Retrieved 17 September 2017. Chopra, R.M. Indo-Iranian Cultural Relations Through The Ages. Iran Society, 2005. Chopra, R. M.,"The Rise Growth And Decline of Indo-Persian Literature", Iran Culture House, New Delhi, 2012. 2nd revised edition published in 2013. Cole, Juan R.I. "Iranian Culture and South Asia, 1500–1900". in: Keddie, Nikki; Matthee, Rudolph P. (ed.). (2002). Iran and the Surrounding World: Interactions in Culture and Cultural Politics. University of Washington Press. ISBN 0-295-98206-3. pp. 15–35. Islam, Riazul, "Indo-Persian Relations". Iranian Culture Foundation, Tehran, 1970. Wikimedia Commons has media related to Mughal art.